A stunning single family community complete with a beautiful entrance monument welcoming residents home is what you'll find at Rivercrest. There’s a state-of-the-art clubhouse with a community pool, stocked pond, 50 acres of green space, and sidewalks lit by street lamps for evening walks! This master-planned community selected as the location of H0MEARAMA® 2017 has everything you need to make your house a home. Just two blocks from the Little Miami River and Bike Trail, it will be easier than ever to stay active and connect with nature. 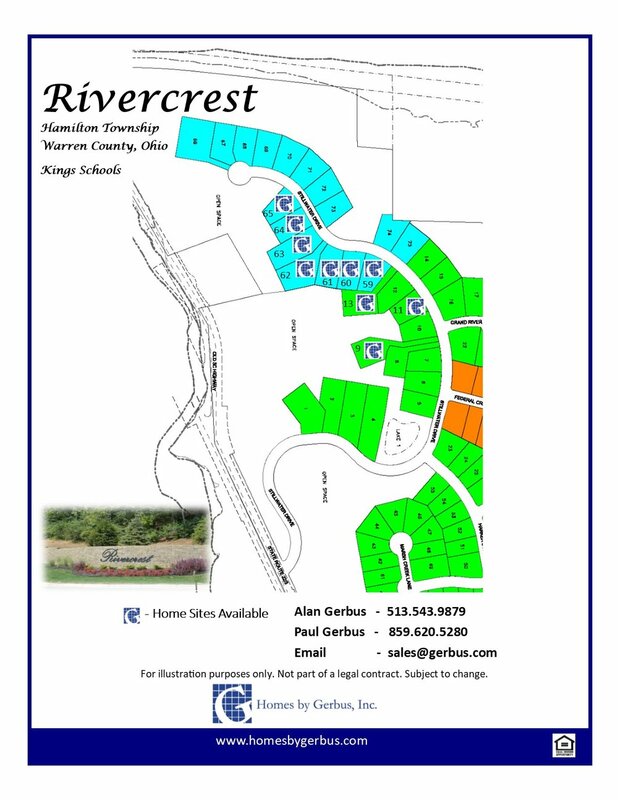 Located minutes from I-71 and I-275, you have quick and easy access to all of Cincinnati. Additionally it’s in the highly-acclaimed Kings School District and Cincinnati’s 2nd safest community, Hamilton Township, making it a great place to live and raise a family. With the resort-style amenities and ideal location, your home here will feel like a relaxing escape while still being close to everything that Cincinnati has to offer. Call us today to learn more about the community, our homes and our building process. We look forward to hearing from you! DIRECTIONS: I-71 North - Take the Mason-Montgomery Road/Fields Ertel Road exit. Follow the exit to the right going towards Mason Road/Fields Ertel Road. Turn left on Mason Montgomery Road, turn right on Fields Ertel Road, turn left on Montgomery Road. Go approximately 7 miles on Montgomery Road and the entrance to Rivercrest is on the left (just on the other side of the bridge that goes over the Little Miami River).